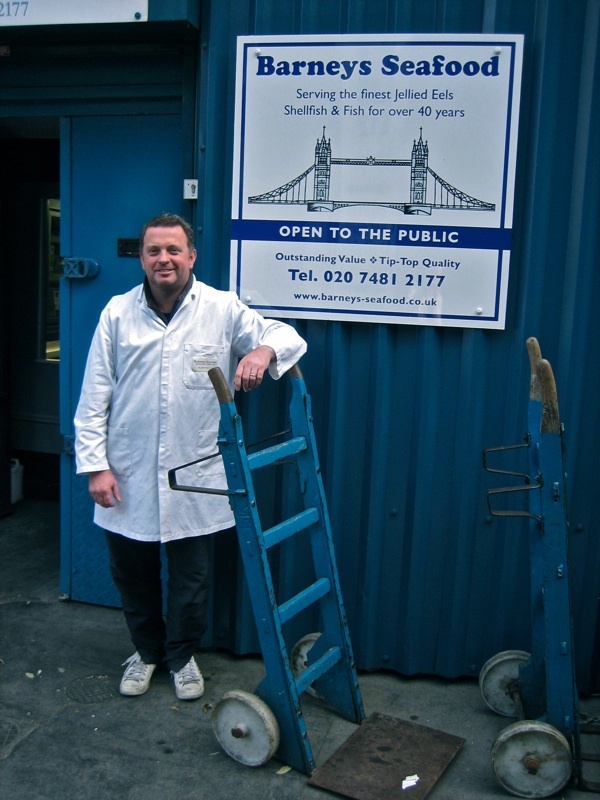 On most mornings throughout the year, just a stone’s throw from the Tower of London, you will find them boiling the eels at Barney’s Seafood, under an old railway arch in Chambers St. For the past thirty-three years Mark Button has presided there over the business that his father Eddie Button took over in 1970 from Barnet Gritzman (brother of Solomon Gritzman, the owner of Tubby Isaac’s), who was here boiling eels since before World War II. 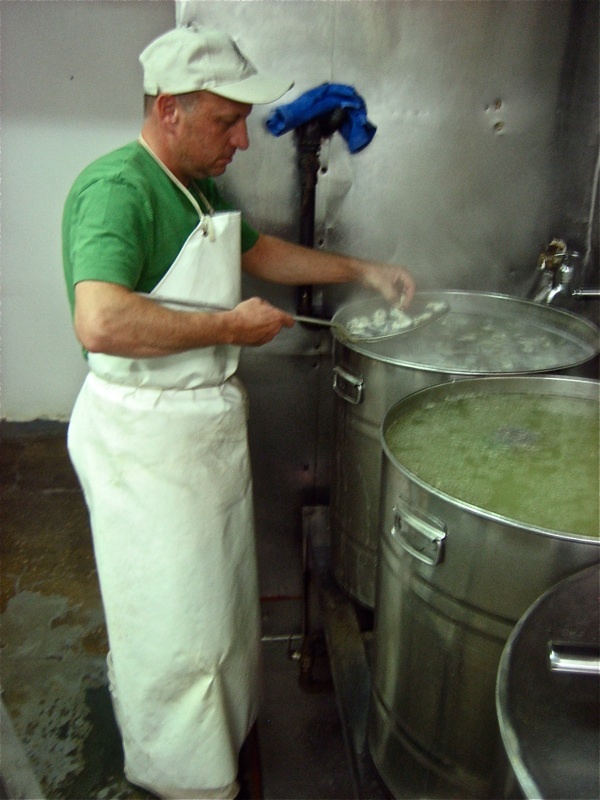 Thus you will know that this is an established location for the pursuit of one of the East End’s most traditional culinary tasks, the preparation of jellied eels. I joined Stuart – a blocksman of twenty-seven years’ experience – with a firm jaw and resolute eyes, at the rear of the arch in a room awash in pools of water, where he brandishes a fearsome curved blade with striking accomplishment, making short work of gutting and chopping great gleaming piles of eels. 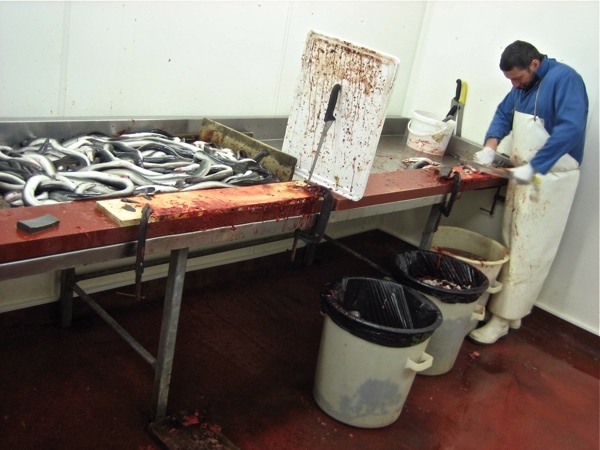 Arriving fresh from the tanks in Canning Town, Stuart tipped the morning’s eels out onto the bench where at first they slithered and slid in a shining mass. Then, gripping each one firmly by the head, Stuart decapitated it in the manner of those traitors of old across the road at Tower Hill, before slicing it open with a flick of the knife and disposing of both the head and the gut into the bin. It is a neat series of honed gestures that require both skill and years of practice, and you can be assured, Stuart has got the knack. 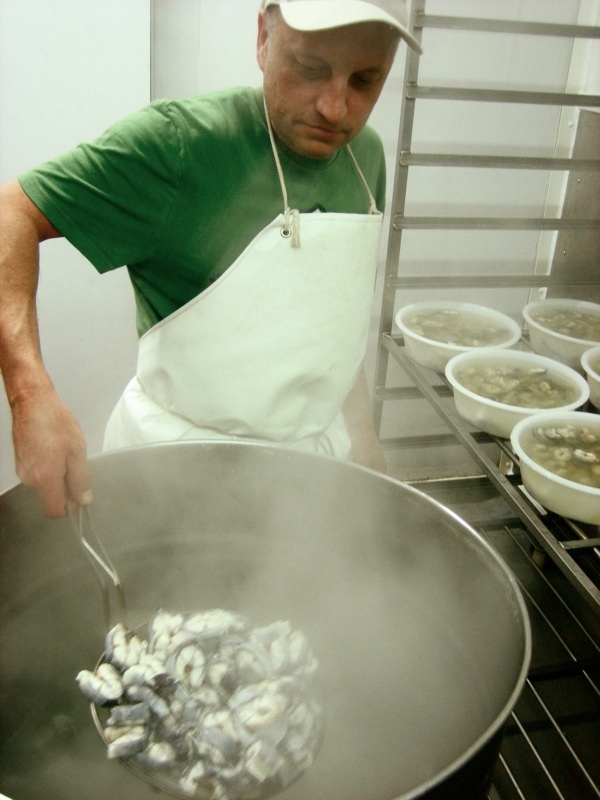 Once Stuart had chopped them up neatly, Paul the personable cook of fifteen years experience cooking eels, came from next door to collect the baskets of sliced fish and carry them through to the pots for boiling. 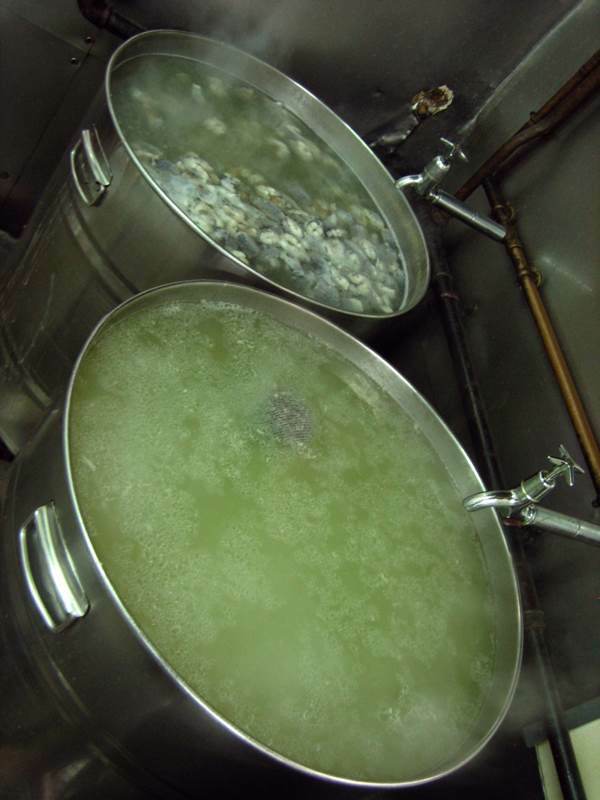 Four tall steel cooking pots stood in a line on gas rings, each with filled with salt water and a bundle of parsley, some with eels already cooking and others just bubbling up to the boil, creating a wonderfully pungent sweet salty warm atmosphere. Paul tipped the eels straight into the hot water to cook, a process that can take between forty-five minutes to an hour and a half, depending on the type of eel, and he turned to lay out the bowls in neat lines upon shelves on the other side of the room, all ready for the eels when they are cooked. “Today we’ve got fresh Dutch eels and some frozen Chinese eels,” he explained helpfully, “Yesterday we had New Zealand eels and in a couple of weeks we’ll have the native Irish eels – they are best, seasonal, grown in the wild, nice texture and nice to eat.” Adding politely, “Have you ever thought of working in the fish industry?” he enquired – eager to make me feel included in such an enthralling process and flattering me with the question. Stuart, a blocksman of twenty-seven years experience who learnt the trade from Eddie Button. Yet another article by the Gentle Author that’s made my day. Barneys is the best seafood you can buy . We don’t call Stuart ‘Stewpot!’ for nothing . I feel a pilgrimage coming on. It’s been far too long. Ah, the jellied eel! Food of Cockneys everywhere and a true delicacy that only those who know can cook properly…and eat properly, come to that. 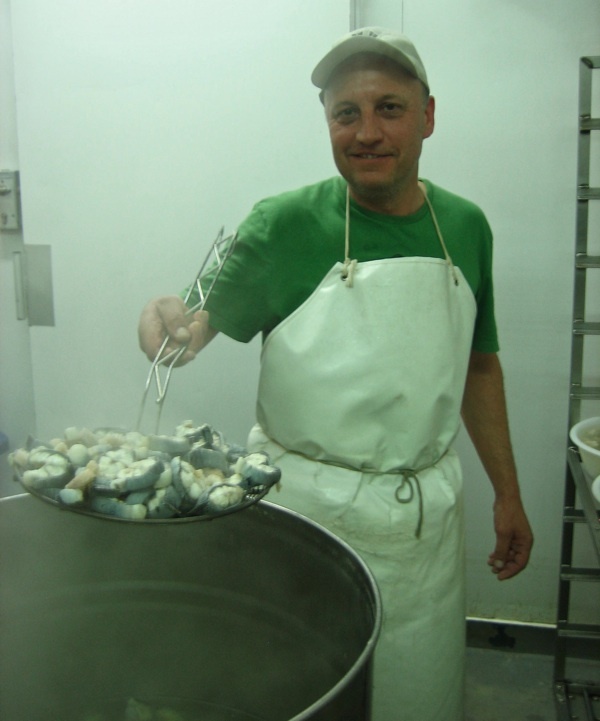 My Dad was a fishmonger – Wet, Dried and Fried was his trade – and he sold jellied eels sometimes, but only if they were cooked by aunt Dolly, who knew the secret of the mysterious eel. She used to do them in big white enamel bowls – you can’t do them in plastic bowls. 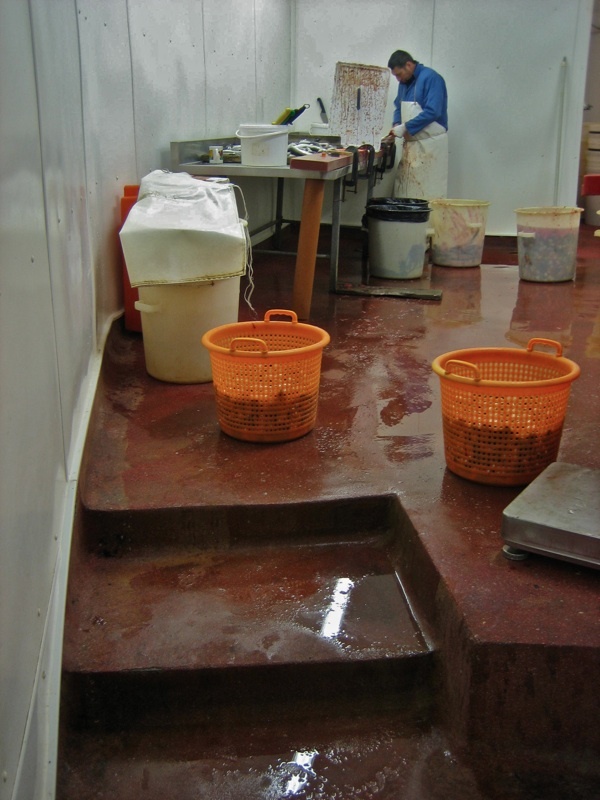 He only bought the best eels – which he said came from the Fens – or Irish eels. 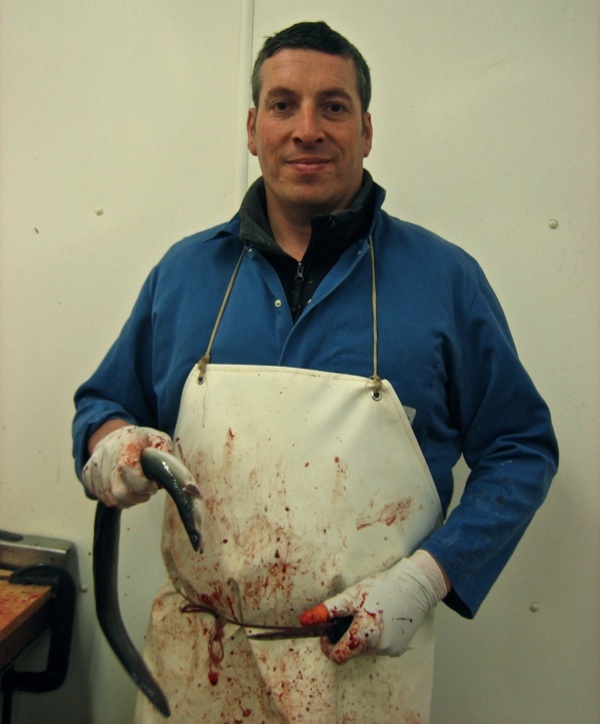 He’d never use Dutch eels: “too rubbery” he said. Occasionally someone would bring him a few eels they’d caught in Regents canal or the river Lea but these were kept for family consumption. He’d keep them in one of the big water butts until Sunday. A fresh eel is a delicious thing and cooked immediately has no peer. Aunt Dolly learnt the secrets from her mother, who learnt from her mother…and so on. The secret was passed down by experience, no-one had a written recipe. When there was a family wedding, funeral or Christening, Aunt Dolly usually got the enamels bowls out and delivered the delicacy for the gathered relatives – who were many in those days – and they queued up to get a small portion of the glistening ambrosia. It was often said – in jest of course – that it was a pity there weren’t more funerals! But preparing the gelatinous fishy feast was only part of the secret, the other part is how you eat them, and that must remain a family secret. Those who know, know. Those who don’t just gulp them down with great show and gusto, spitting bones and bits of skin, washed down with a pint of beer. But this is to miss to piquant flavour of the well-cooked Ely eel and is not to be encouraged. 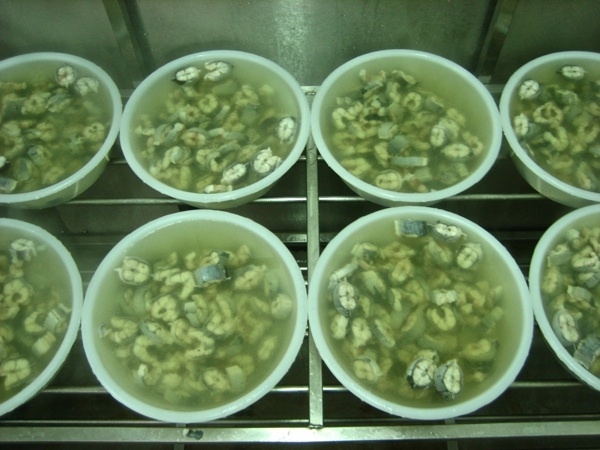 The jellied eel is the Cockney’s caviar, to be savoured and enjoyed in the same manner as the French enjoy Escargot or the Spanish wax lyrical about Paella. And you should never, ever eat jellied eels with mash. Disgusting and just wrong in so many ways. Aunt Dolly would turn in her grave if she knew such behaviour went on. Interesting about the eels but I prefer pie and mash – and I urge you to go to Tony’s Pie & Mash in the Market Square, Waltham Abbey, Essex and sample their wares. They regularly gain first prize for the best Pie & Mash shop in the area and my 24-yr old nephew, who’s eaten a few in his time, declares it spot on! He and I go there often! The pictures are fascinating! Thanks, Gentle Author. However, I support Valerie’s point that it’s not for me, as I can never make myself eat something that died in front of my eyes. The process is indeed very interesting. Reading literature and searching the Internet on some writing tips and blog topics, I rarely come across such posts. Yours made me look at things differently. It has inspired me to thing about the next post on my blog that will be connected with sea theme. That was really interesting. There’s a really fascinating book called Eel by Richard Schweid, in that great little Animal series published by Reaktion. It explains a great deal about the mysteries of eels. The spitalfields life website is so interesting. My family moved into the Easy End in 1790. 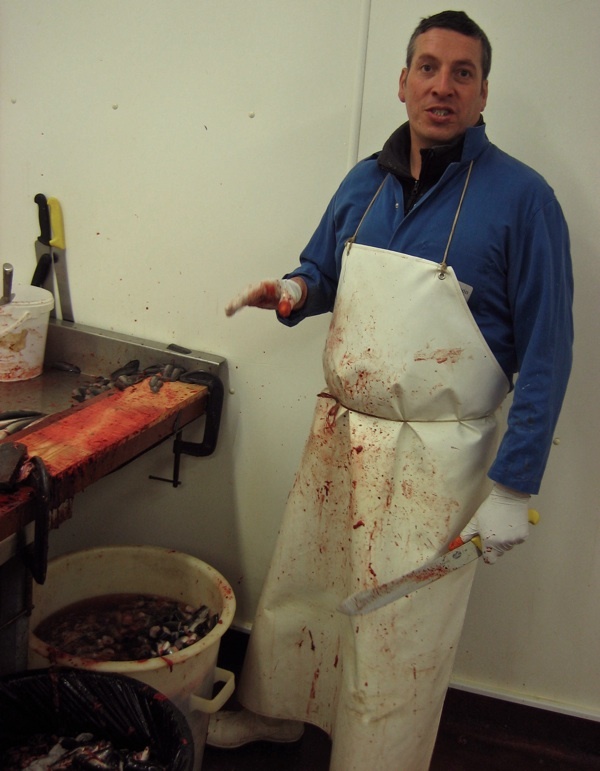 I love jellied Eels and stewd Eels, well I should do… I was weened in Pie and mash shops. I have always found Eels intetesting. 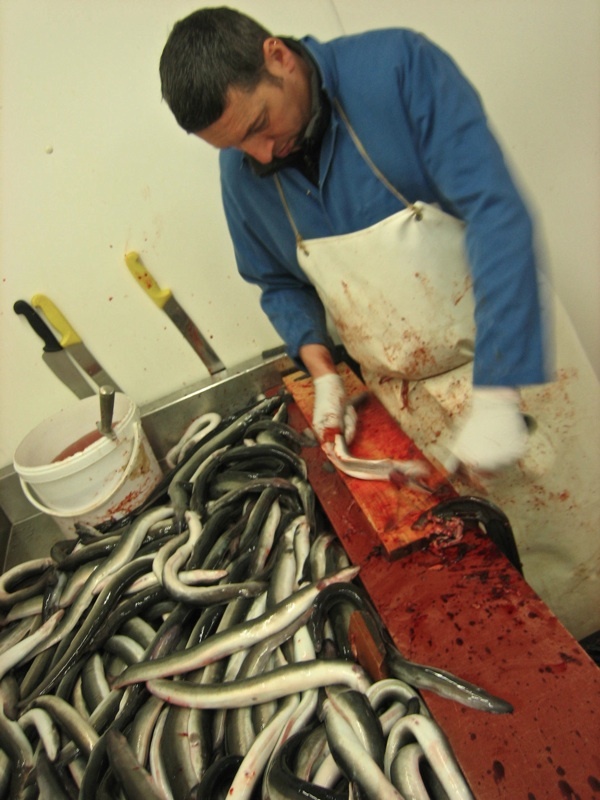 The best Eels that I caught were from big salt water lakes in Kent, fed by The Thames. I am going back 30 years ago when you could catch them for the table. My mate Bill caught one of 5 1/2 lbs. We used to catch around 20 and head home with them alive in a big wet sack that was placed in a big tub we made from cutting a blue plastic barrel in half. Next morning I would kill them, and jelly some and freeze some down for stewing. I would just chopp them in chunks about 2 inches thick for jelling and cook them in salt water to tast and a big sprig of parsley. let them cool, put them in the fridge and let them set in thete own jelly. lovley, fit for a king my dad would say. As a matter of interest. He brought it home and put it in the bath… it was almost 5 foot long and weighed 8 lbs 2 oz. The rod cought recourd at the time was 8lbs 8 oz. He couldn’t bring himself round to kill it. Dad put it back in the sack and drove down to The Theames and wached it swim strongley away.